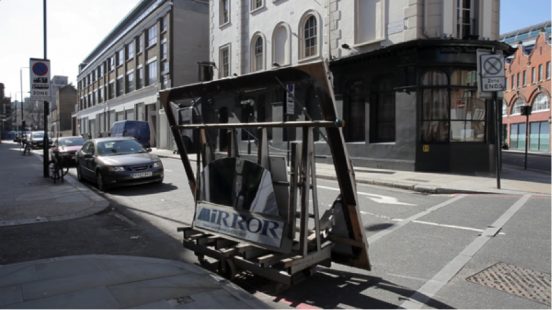 Photofusion is pleased to announce the first London solo show of photographic and video artist Nicholas Smith. Reflections on Authority consists of a collection of multi-media pieces that document ‘designated areas of cultural display’. Smith’s visual practice sits within a discourse of curation on a basic level and within the realms of making images at a more complex level. His practice is developed in a duality of inside and outside, still and moving, making and organising, writing and reading. © Nick Smith, Ancient Rhythms HD Video, 8 mins looped. 2012. His recent projects explore the material and histories of visual representation through the perspective of the third person (the photographic image). For this exhibition Smith has made four new films which are shown as two diptychs: Ancient Rhythms/Modern Rhythms and An Occurance/l’Ècran. The films have been shot on a Digital SLR camera, with Smith becoming increasingly interested in how this device allows him to disappear in public spaces. The works are created using ‘perfect fragments’ selected from hours of footage, using static shots that are tightly looped to create a movement that is so reduced it brings the moving image closer in its appearance to the still image. Born in Liverpool in 1982, Smith lives and works in London. Recent projects include; a solo exhibition in Concord Space, Los Angeles, 2013, a curated walk based on the film Falling Down, Los Angeles, 2013. His work has also been included in Liverpool Independents Biennial 2012, Altitude 1000, Switzerland 2011 and Bloomberg New Contemporaries 2009. Smith received an MA in Photography from the Royal College of Art in 2012 and is Editor of Relief, an experimental curatorial publishing project. Nicholas Smith will be giving a talk and walking tour of the exhibition, accompanied by a guest curator, George Vasey, an independent curator and writer based in London. Vasey’s recent curatorial projects include ‘Jo Spence & Alexis Hunter’, Richard Saltoun, London, 2013 and ‘A Small Hiccup‘, travelling to Grand Union, Birmingham. His writing has appeared in Kaleidoscope, Art Review, Art Monthly, thisistomorrow and is currently a writer in residence at the Jerwood Space, London.